Over the last few years we’ve been slowly discontinuing our magazine subscriptions. My daughter had me take an online quiz to find out what size carbon footprint we had (uh oh! ), so I thought saving a few additional trees was in order. We’re down from a lot to only a couple of subscriptions… Food & Wine is the last one left for me. I can’t bring myself to cancel my subscription. 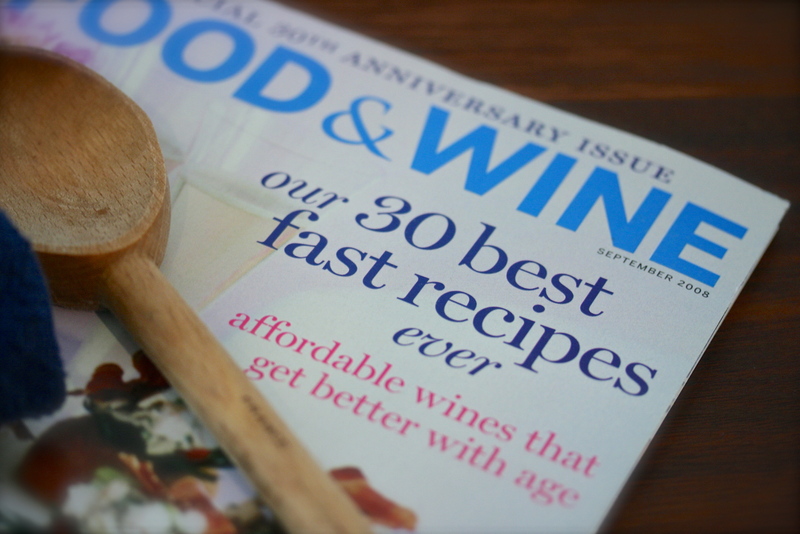 Of all the foodie mags, it’s my favorite. I used to save my food magazines. Carefully ear-marking all the pages with the most tempting fare, I would keep this sacred stack, never ever considering it was time to bring them to the recycling bin. Alas, I caved one year while spring cleaning, finally realizing how easy it is to find everything online. Heat a large sauté pan over medium-high heat, add one tbsp of olive oil and the prosciutto and garlic, stirring constantly until the garlic is fragrant and begins to turn golden in color. Remove from the pan with a slotted spoon and place on a plate, set aside. Season the pork with salt and pepper. Put the remaining tbsp of olive oil in the pan and brown the pork until nicely colored on both sides and just cooked through. Transfer to a platter and cover with foil to keep warm. Add the balsamic vinegar to the skillet and scrape up the brown bits that have formed on the bottom of the pan. 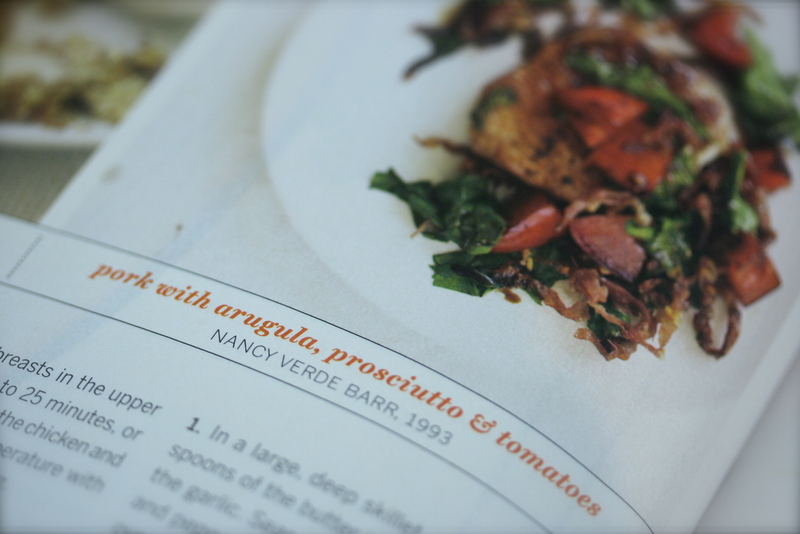 Add the arugula and stir until almost wilted, add the tomatoes and the prosciutto and garlic that you reserved. Cook over high heat for just a couple of minutes. Season with salt and pepper. 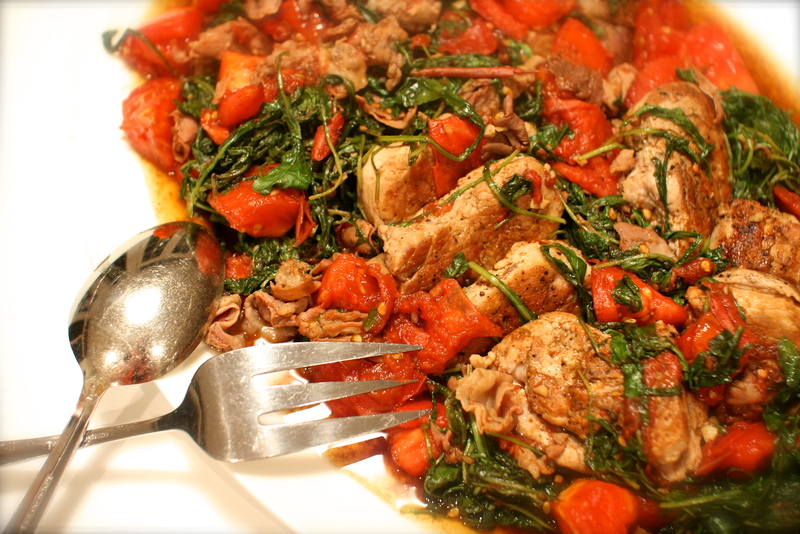 Pour the arugula and tomato mixture over the pork and serve. * The recipe says to cook the pork to medium. I just can’t do the pink pork thing, so I cook the meat until it’s just cooked through. Feel free to cook it to medium if you prefer. In Pennsylvania we have State Stores, a.k.a. Wine & Spirits Stores. These are owned and operated by the Liquor Control Board and are the only place in PA where we can buy liquor and wine. It all seems so uncivilized and overly controlled. I heard on the news quite a while ago, Pennsylvania was considering selling their State Stores to private owners. I wonder what’s happening with that? I always think the wine selection is so much better at the independently owned wine stores across the river in New Jersey. 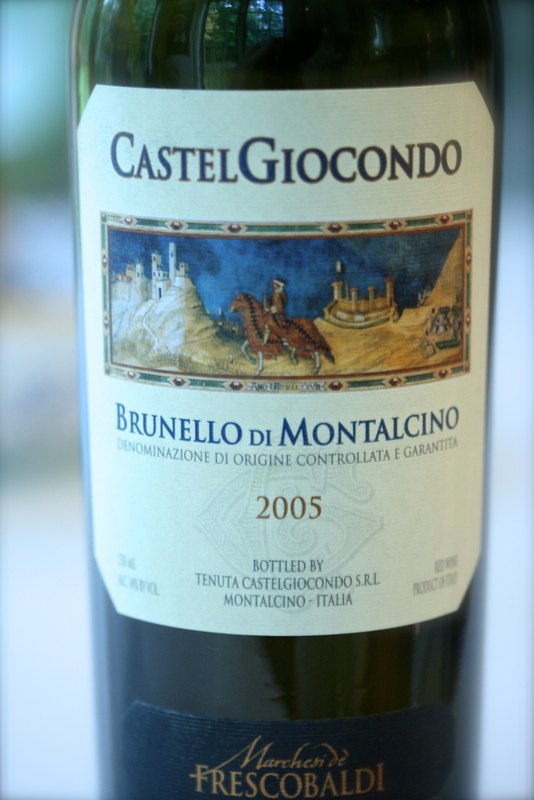 This 2005 Brunello di Montalcino is delicious, and I actually found it at the State Store! It’s smooth and easy to drink, a new favorite in our wine collection. At around $30.00 a bottle, I know it’s a bit on the pricey side, but truly perfect for a special occasion. It would be a nice bottle to take to a friend’s over the holidays, too.